Welcome to the N.J.V. 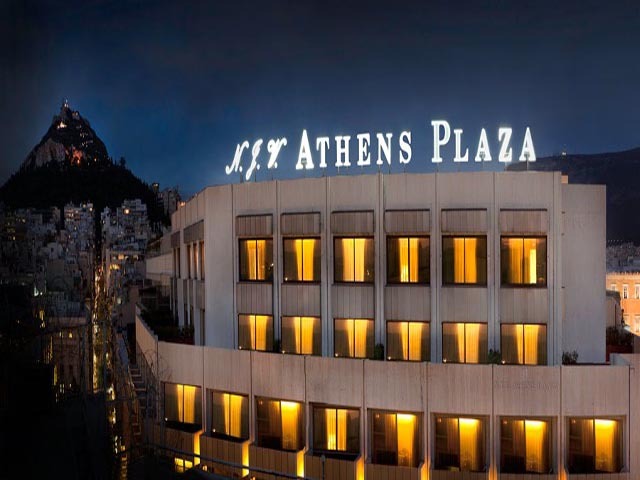 Athens Plaza, a five-star deluxe hotel, Athens most exclusive address for demanding travellers. The hotel boasts 159 luxurious rooms and 23 suites with breathtaking views of the Acropolis. N.J.V. Athens Plaza is ideally located on Constitution Square (Syntagma), in the heart of the business and shopping districts, and within walking distance of the Acropolis and the Old City (Plaka). Its prominent location gives you the opportunity to hop on any bus, metro, trolley, tram, or hail a taxi, and within minutes be at one of the many museums, archaeological sites, and tourist attractions that this great city has to offer. Restaurant specializing in Mediterranean cuisine, with unique traditional Greek dishes, captures the nobility and allure of the historic Syntagma Square. Breakfast is served daily from 7.00 to 11.00, lunch from 12.30 to 16.30 and dinner from 19.00 to 00.30. Located in the lobby area, it offers an excellent variety of coffees and succulent desserts in relaxing surroundings. Open daily 08:00 to 23:30. In the intimate wood panelled surroundings, guests enjoy the atmosphere of old Athenian clubs, while sipping cocktails and tasting delicious snacks. Open daily from 11.00 to 01.30.
business centre (secretarial services from 09.00 to 17.00, computer with internet access, fax, copier, printer, rental of personal computers, fax and mobile phone). Whether you plan a conference, business meeting, product launch, seminar or dinner dance, versatile function rooms - and specially designed suites - with state of the art audio-visual equipment are at your disposal. The experienced conference and banqueting personnel provides efficient service to satisfy even the most discerning guest and assures the success of any function. The technical assistance and equipment available at the hotel include podium, head table microphones, laser pointers, flip charts, overhead, slide and video data projectors, wide screen TV and VCR, while outside contractors make available a wide range of additional technical equipment. The N.J.V. Athens Plaza features 159 spacious and well-appointed guestrooms, and 23 luxurious suites. All guestrooms and suites have been individually designed in intricate detail with the finest silks and taffetas while the suites feature decorations from Ralph Lauren, Fornacetti and Versace. *Non-smoking rooms are also available. Decorated with warm greens and browns and all modern amenities, the guest rooms interior reflect elegance and style. They offer a choice of single, queen or twin beds. Facing the snappy and pedestrian Voukourestiou Street, these rooms reflect comfort and elegance. They feature elegant decors, marble bathrooms with large bathtubs and lavish amenities. Available with twin or queen beds. Acropolis and Stadiou Street. The ones that face the square offer the choice of interconnection, the ones facing Stadiou the choice of an extra bed, while they all offer the choice of king or twin beds. Supremely located on the eighth and ninth floors, these 38 square meters of each of the six junior suites are covered in the warmth of the lilac and the azure. The marble bathrooms, with separate bathtubs, the king size bed with the exquisite designer fabrics and all modern amenities, as well as an exceptional view of Acropolis, make these suites the finest choice for any business or leisure traveller. Created to offer the ultimate in luxury hotel living, the 48 square meters of each of the seven executive suites are elegantly decorated in brown and olive green colours. The marble bathrooms offer a separate bathtub with luxurious amenities and the twin beds are with fine and stylish linen fabrics. Furnished and decorated with designers' original artwork, these nine large suites create an unparalleled atmosphere of comfort and exquisiteness. They offer the choice of a king size or twin beds, they all include luxurious amenities and are located on the hotel's top floors, overlooking the Acropolis or Stadiou Street. This luxurious two-level residence is truly the ultimate in privacy and luxury, with a magnificent view of the Acropolis, the Saronic Gulf, the Greek Parliament and Syntagma Square. It features a grand foyer on the lower level with a fully equipped bar, a dining room for up to ten people, a living room elegantly decorated in claret, as well as a separate guestroom. The upper level features a master bedroom dressed in gold, a luxurious marble and gilded bathroom with a separate shower cabin, as well as a jacuzzi tub.